Physicians with current and valid licenses in the United States, Canada, or Mexico who read any 3 of the selected continuing medical education (CME) articles in this issue of JAMA, complete the CME Evaluation Form, and fax it to the number or mail it to the address at the bottom of the CME Evaluation Form are eligible for category 1 CME credit. There is no charge. The American Medical Association (AMA) is accredited by the Accreditation Council for Continuing Medical Education to sponsor CME for physicians. The AMA designates this educational activity for up to 1 hour of category 1 CME credit per JAMA issue toward the AMA Physician's Recognition Award (PRA). Each physician should claim for credit only those hours that were actually spent in this educational activity. Physicians with current and valid licenses in the United States, Mexico, or Canada are eligible for CME credit even if they live or practice in other countries. Physicians licensed in other countries are also welcome to participate in this CME activity. However, the PRA is available only to physicians licensed in the United States, Canada, or Mexico. To earn credit, read 3 of the articles listed below that are designated for CME credit carefully and complete the CME Evaluation Form. The CME Evaluation Form must be submitted within 1 month of the issue date. A certificate awarding 1 hour of category 1 CME credit will be faxed or mailed to you; it is then your responsibility to maintain a record of credit received. One of our goals is to assess continually the educational needs of our readers so we may enhance the educational effectiveness of JAMA. To achieve this goal, we need your help. You must complete the CME Evaluation Form to receive credit. 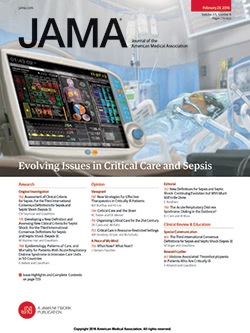 JAMA is a general medical journal. Its mission and educational purpose is to promote the science and art of medicine and the betterment of the public health. A flexible curriculum of article topics is developed annually by THE JOURNAL's editorial board and is then supplemented throughout the year with information gained from readers, authors, reviewers, and editors. To accommodate the diversity of practice types within JAMA's readership, the Reader's Choice CME activity allows readers, as adult learners, to determine their own educational needs and to assist the editors in addressing their needs in future issues. Readers of JAMA should be able to attain the following educational objectives: (1) select and read at least 3 articles in 1 issue to gain new medical information on topics of particular interest to them as physicians, (2) assess the articles' value to them as practicing physicians, and (3) think carefully about how this new information may influence their own practices. The educational objective for each CME article is given after the article title below. Educational Objective: To learn the efficacy of a new drug for preventing influenza. Educational Objective: To learn the prevalence of abnormal brain MRI findings in asymptomatic persons. Educational Objective: To learn that some people with diabetes or cardiovascular disease may be genetically more susceptible to cognitive decline. Educational Objective: To learn how religious and other exemptions from vaccination may affect the spread of measles. Educational Objective: To learn that a ventilatory strategy may attenuate the inflammatory response in acute respiratory distress syndrome. Educational Objective: To understand the clinical value of Lyme disease tests. Educational Objective: To understand how to evaluate articles about using computers to improve patient outcomes. After reading 3 of these articles, complete the CME Evaluation Form.